Please fill out the form below to request a "Quick Quote". Click on the "Quick Quote Request" image to close this form. Widely known as an industry leader in the design and manufacturing of custom printed lanyards, Lanyards-4-Less.com leads the way when it comes to quality, price and customer service. Lanyards have long been a promotional product mainstay that are utilized for the purposes of displaying identification for convention and large event attendees as well as to help enhance the identity and branding for many corporations, businesses, educational institutions, athletic teams and more. Ready to order your lanyards? Let’s get started today! Please contact one of our promotional lanyard specialists and let them assist you in personalizing your lanyards today or check out our brand new and easy to use You Design…You Order page. Should you have questions about pricing we’d invite to view what out-of-this-world pricing have by clicking here. New Service! You Design…You Order. No Hassles! After extensive market research we have heard from you, the consumer, and now we are responding with a new avenue for you to design and order custom lanyards your way no matter what time of the day it may be. Want to design and order neck and ID lanyards at midnight after all other lanyard companies have gone for the day? We’re here to help make that a reality for you! Visit our Order Now page and get started today. Our team has worked hard to make this process and easy and user-friendly as possible. Our You Design..You Order feature is just another way we’re working hard to earn your valued business. Start ordering your personalized lanyards now! Want a World of Custom Lanyard Style and Color Choices? Look No Further! A variety of styles and colors are available in order to customize your lanyards. Simple standard PMS colors are available or very specific colors can be applied as well. Lanyards-4-Less also offers multiple fabric styles to choose from which include imprinted polyester, nylon, tubular, woven polyester material and eco friendly / bamboo lanyards. 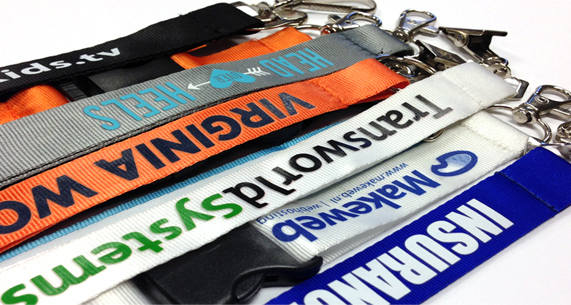 Our desire is to outfit you with custom printed lanyards so they fit the use of you, the customer, in every way. 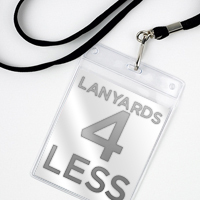 At Lanyards-4-Less, quality, service and low cost lanyards have been and continue to be hallmarks of our company. Features at our company such as FREE shipping, FREE artwork & revisions and 100% price match guarantee are what sets us apart from the rest and we also proudly stand behind our 100% satisfaction guarantee. Now that you’re ordering lanyards please take a look at our wide selection of both free and paid attachments for your neck lanyards as well as retractable badge reels which can be personalized to your liking from one color to full color, we can do it. Need clear ID badge holders? We can help you there as well whether you are in need of a standard size or custom size. Order this product and use them on your custom printed lanyards for identification purposes, particularly at conventions and large gatherings of people. Lanyards-4-Less.com offers a full array of custom ID lanyard products and accessories. There are multiple ways you may begin the ordering process and they are as follows: Visit our Order Now page and start designing and ordering your custom lanyards. Phone: 1-800-670-9092 Email: sales@lanyards-4-less.com Our live promotional lanyard specialists are standing by to assist you in your order along with a proven and talented team of graphic designers who are available to assist you with any artwork needs. Listed below are a few of the many great features that we offer with every lanyard order! Stay up-to-date on our current sales and specials. Lanyards-4-Less – New & Improved!